While the HDBSCAN class has a large number of parameters that can be set on initialization, in practice there are a very small number of parameters that have significant practical effect on clustering. We will consider those major parameters, and consider how one may go about choosing them effectively. The primary parameter to effect the resulting clustering is min_cluster_size. Ideally this is a relatively intuitive parameter to select – set it to the smallest size grouping that you wish to consider a cluster. It can have slightly non-obvious effects however. Let’s consider the digits dataset from sklearn. We can project the data into two dimensions to visualize it via t-SNE. If we cluster this data in the full 64 dimensional space with HDBSCAN* we can see some effects from varying the min_cluster_size. Increasing the min_cluster_size to 30 reduces the number of clusters, merging some together. This is a result of HDBSCAN* reoptimizing which flat clustering provides greater stability under a slightly different notion of what constitutes a cluster. Now most points are clustered, and there are much fewer noise points. 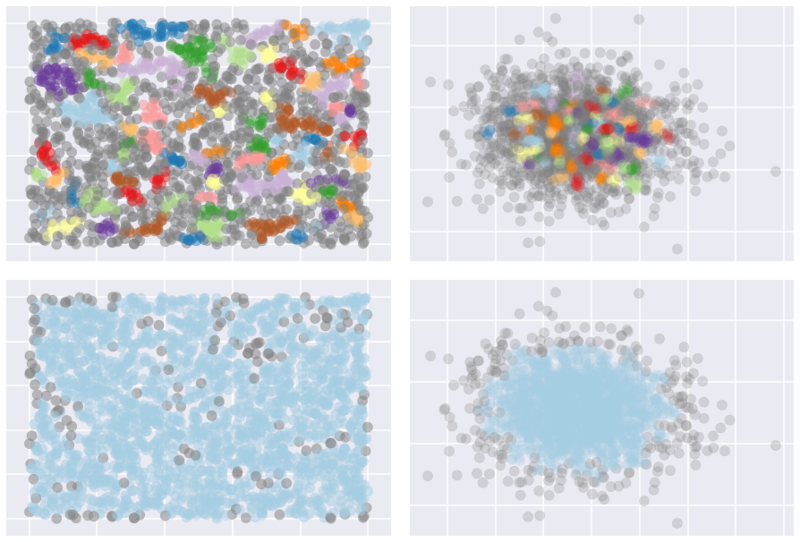 Steadily increasing min_samples will, as we saw in the examples above, make the clustering progressively more conservative, culminating in the example above where min_samples was set to 60 and we had only two clusters with most points declared as noise. A further parameter that effects the resulting clustering is alpha. In practice it is best not to mess with this parameter – ultimately it is part of the RobustSingleLinkage code, but flows naturally into HDBSCAN*. If, for some reason, min_samples is not providing you what you need, stop, rethink things, and try again with min_samples. If you still need to play with another parameter (and you shouldn’t), then you can try setting alpha. The alpha parameter provides a slightly different approach to determining how conservative the clustering is. By default alpha is set to 1.0. Increasing alpha will make the clustering more conservative, but on a much tighter scale, as we can see by setting alpha to 1.3. HDBSCAN supports an extra parameter cluster_selection_method to determine how it selects flat clusters from the cluster tree hierarchy. The default method is 'eom' for Excess of Mass, the algorithm described in How HDBSCAN Works. This is not always the most desireable approach to cluster selection. If you are more interested in having small homogeneous clusters then you may find Excess of Mass has a tendency to pick one or two large clusters and then a number of small extra clusters. In this situation you may be tempted to recluster just the data in the single large cluster. Instead, a better option is to select 'leaf' as a cluster selection method. This will select leaf nodes from the tree, producing many small homogeneous clusters. Note that you can still get variable density clusters via this method, and it is also still possible to get large clusters, but there will be a tendency to produce a more fine grained clustering than Excess of Mass can provide. In contrast, if you are getting lots of small clusters, but believe there should be some larger scale structure (or the possibility of no structure), consider the allow_single_cluster option. By default HDBSCAN* does not allow a single cluster to be returned – this is due to how the Excess of Mass algorithm works, and a bias towards the root cluster that may occur. You can override this behaviour and see what clustering would look like if you allow a single cluster to be returned. This can alleviate issue caused by there only being a single large cluster, or by data that is essentially just noise. For example, the image below shows the effects of setting allow_single_cluster=True in the bottom row, compared to the top row which used default settings.